By coincidence here is an example of a phenomenon we mentioned the other day, a litigant’s attempt to avoid the claw-back. This one is a bit unusual because it comes from a class of cases — low-end PI claims — that will not do so from now on. But, needless to say, the court does not allow it. 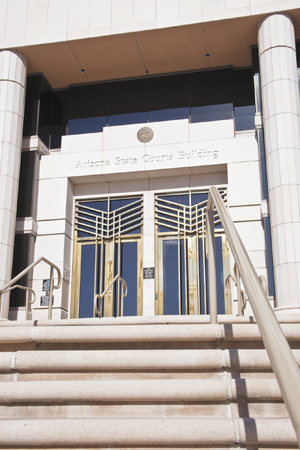 Plaintiff wanted to avoid Pima County’s FASTAR program. (Bureaucrats no doubt think the acronym exceedingly clever. This is the program that is to bring us “more efficient and inexpensive, yet fair” resolution of cases, according to the order enacting it; good of the Supreme Court to mention that last part, at least in passing. It is a pilot program in Pima until 2020, at which time it will be deemed a success and come to a courthouse near you.) The program junks compulsory arbitration and replaces it with a choice between a short trial (following abbreviated discovery) and an arbitration from which the plaintiff cannot appeal. Plaintiff filed a motion to get compulsory arbitration instead and took special action from its denial. The court summarizes her arguments as being that the compulsory arbitration statute, 12-133, gives her substantive rights that the FASTAR rules violate. The respondent judge filed a brief arguing that the rules and the statute are consistent; the concurring opinion agrees but the majority does not. So it concludes that, while an appeal from compulsory arbitration has been held to be a substantive right, the arbitration itself is procedural. And as to the right of appeal, FASTAR merely “conditions” it. The rules therefore displace the statute under Seisinger (2009) and several earlier separation-of-powers cases. Plaintiff also argued that FASTAR did not apply to her. The Supreme Court’s administrative order establishing the pilot program lowered Pima’s jurisdictional limit for compulsory arbitration to $1,000. But although the county, in order to set itself up for FASTAR, had requested this as part of a new set of local rules the Supreme Court’s separate order approving those rules was not entered until several months after FASTAR began. Plaintiff filed her case after FASTAR but before the separate order. The Supreme Court’s rules don’t actually allow local rules to be changed by administrative order but the Court of Appeals tells us decisively that “we cannot say the supreme court [sic. ; the opinion capitalizes Superior Court but not Supreme Court] lacked authority” to do so in order to implement FASTAR. Whether an order is “administrative” makes a difference to lower courts but not to the Supreme Court because of that court’s “broad constitutional authority to make administrative rules.” And, apparently, to ignore them. Plaintiff also argued that 12-133 should be read in conjunction with 22-201, which now gives the Justice Court exclusive jurisdiction up to $10,000. So the legislature didn’t intend that the limit for compulsory arbitration in Superior Court be reduced to a point below that court’s jurisdiction. (At least we think that’s what was being argued; neither opinion really explains it.) The majority “responds” to the argument by rejecting it in a footnote as “somewhat strained.” The concurrence adds, in language slightly oblique, that it makes no difference because the legislature has no power to prevent FASTAR anyway. Based on the figure we have heard, the number of civil jury trials held in Pima County last year would, thirty years ago, have kept one division of that court busy for perhaps six weeks. But remember the iron rule: delays in the system are always your fault, never the bureaucrats’. This requires the strictly procedural decisions that, first, some people haven’t been damaged badly enough to deserve actual discovery and an actual trial and, second, even those who have been must be micromanaged by functionaries whose real concerns are the numbers on their “processing” spreadsheets. Whether any of that is fair is an afterthought, to be tacked on clumsily with a comma. This problem with supersedeas bond law has been fixed but the fix isn’t effective until January 1, 2019. So the court accepted this special action to address the issue. Defendant lost below (we simplify a bit; there were many parties to this lengthy and complex case). They sought to file a property bond (i.e., a supersedeas bond secured by property rather than a cash bond). Salt River (App. 2009) concluded that this was permissible under prior ARCAP 7, which allowed the court to alter the amount and conditions of the security. But then, in 2011, the legislature passed 12-2108 specifying the amount of supersedeas bonds and in response Rule 7 was amended effective 2012, leaving out the language that Salt River relied on. So Plaintiff argued that the trial court could not allow a property bond. The trial court agreed. Defendant filed special action. Yet another notice-of-claim case. Its unfortunate that these still happen. Plaintiff’s notice of claim against Pinal County was signed by Plaintiff’s lawyer. The county denied it; Plaintiff filed suit. The county moved to dismiss because the statute requires that the notice be “executed by the person [bringing the claim] under penalties of perjury.” The trial court denied the motion but ordered Plaintiff to comply with the statute, which it then did. The county filed a special action anyway. What if the lawyer signs under penalty of perjury? The court raises the issue even though the parties didn’t — and for that reason declines to answer it. One assumes that there was a point to the footnote other than allowing the court to pretend to superior intellect; it would be interesting to know what the court imagines that was. “[W]ith so many notice-of-claim cases on the books now, if you have to argue waiver then you made a mistake. Trying to cut corners on this statute is the sort of thing you could end up telling your carrier about some day.” That’s not the court — that’s us, four years ago.